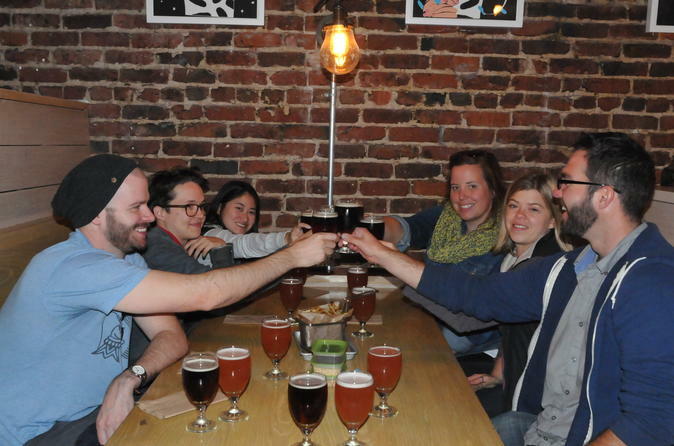 Learn, drink, and celebrate beer with your new drinking buddies on this craft brew pub crawl! All the beer you need and light snacks are included as your small group visits 3 microbreweries and/or craft beer bars. This SOMA beer crawl is the perfect way for a craft beer lover to spend an afternoon in San Francisco. Half tour, half celebration, there is a focus on craft beer education and bringing SOMA to life as you enjoy many generous samples (included in tour price) of unique locally made beer and become fast friends with the others on tour. Visit 3 San Francisco microbreweries and/or craft beer bars and use our industry connections to bring each stop to life in a way you could not achieve on your own. Learn the unique role each of our destinations plays in the craft beer scene, discover the backstory of each beer you consume, and improve your knowledge of the brewing process with a mini brewery tour. Whenever possible, you will go behind the scenes and talk with knowledgeable brewery employees who can bring additional insight. While you walk from one brewery to the next, your guide will briefly, but vividly, describe SOMA's checkered past and brewing history, using your surroundings as reference points. As time passes and beer flows, friendships are made and informative sessions transition into a more festive atmosphere, but your guide will never stop educating those who want to hear more. The tour will have a clear official conclusion after about 3.5 hours. By this point you should be full of smiles and new knowledge, as well as enough beer that you can't drive home, but you could still walk home. In San Francisco there is always another great bar nearby and each tour ends with the opportunity to join your fellow beer lovers for another pint, a bite to eat, and more good times. Whether or not you're able to stick around for that, your guide will be happy to help you find a way home, or recommend other excellent activities in the area.